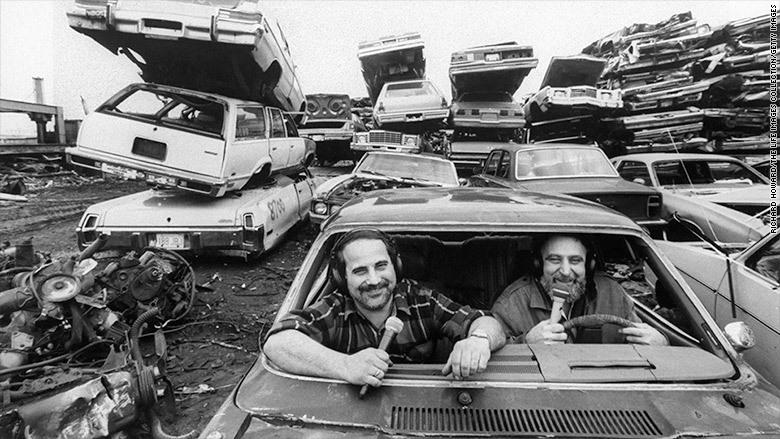 Tom and Ray Magliozzi, hosts of NPR's Car Talk, will be inducted into the Automotive Hall of Fame. Rejoice Car Talk fans. Click and Clack are going to the Automotive Hall of Fame. Tom and Ray Magliozzi, the wisecracking mechanic brothers who were the hosts of the famed National Public Radio show for 25 years, will be inducted into the hall in July, it was announced Wednesday. The Magliozzis loved cars, but often made fun of their shortcomings on the popular NPR broadcast, which won the Peabody award for public service in 1992. On the show, listeners would call in to describe their car problems, often trying to imitate the sound that their cars were making. The brothers would offer a diagnosis, and a number of jokes. They adopted the nicknames Click and Clack, the Tappet brothers, but they never said who was Click, and who was Clack. They both graduated from the Massachusetts Institute of Technology, and they actually opened a do-it-yourself car repair shop, dubbed Hacker's Haven, in 1973, in Cambridge, Mass. They recorded the show from 1987 until 2012, when Tom Magliozzi was forced to retire due to suffering from Alzheimer's. Tom Magliozzi later died of complications from the disease in 2014 at the age of 77. He is survived by his brother Ray Magliozzi, who is 12 years his junior. NPR continued to distribute episodes made up of show highlights until last fall. The Automotive Hall of Fame typically honors people who work in the auto industry. This year's other inductees include Mike Jackson, CEO of AutoNation (AN), the nation's largest auto dealer, and Frank Stronach, the founder Canadian auto parts maker Magna International (MGA). But this isn't the first time that Automotive Hall of Fame has honored an outsider. In 2016 the organization inducted auto safety advocate Ralph Nader, despite the fact that he was a long-time critic of the industry.